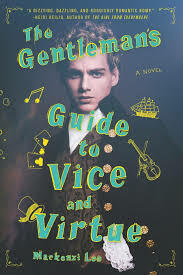 Hi All you lovely BookDragons and welcome to my stop on the Sunday Street Team Blog Tour for The Gentleman's Guide to Vice and Virtue by Mackenzi Lee. I've had an AMAZING time organising this tour as a part of my SST Co-Host duties and visiting all your lovely blogs up until today. If you're a blogger and would like to sign up for the Sunday Street Team, you can fill out this form on Nori's Blog and we'll get back to you! Blurb Description: Henry “Monty” Montague was born and bred to be a gentleman, but he was never one to be tamed. The finest boarding schools in England and the constant disapproval of his father haven’t been able to curb any of his roguish passions—not for gambling halls, late nights spent with a bottle of spirits, or waking up in the arms of women or men. I first heard about this book a year ago from an author on my blog who, while writing a list about the books she was most excited for also cheated a bit and introduced me to The Gentleman’s Guide to Vice and Virtue. As soon as I read they synopsis almost a year ago, I KNEW that this was one book I would DEFINITELY read. So, now that I’ve finished it, let’s break it down. Writing in the eyes of a 18th century boy who has lived his whole life as the privileged son of an earl, Mackenzi Lee managed to capture him spot on. If you’ve read any reviews, most people say that Henry Montague (Monty) took a while to warm up too, and it is the truth, but that’s because of who boys like him used to be back then. For the place in history this was set it, I absolutely loved Mackenzi’s authentic writing. ALL POINTS TO THE IDEA because combining history, a Grand Tour across Europe, two GORGEOUS gay and bisexual best friends and throwing in the idea of feminism into the heads of boys in this time? SIGN ME UP. I was so on board with everything about this book from the minute I heard it and it DID NOT DISAPPOINT. Apart from that, I LOVED THE PLOT. Equal parts history and culture in Europe during that time, this book was SO WELL CONSTRUCTED, throwing all the carefully made plans of the Grand Tour out of the Window as they entered their first leg. I LOVED IT. "You might be the only person left on Earth who thinks me decent." Between us, I feel his knuckles brush mine. Perhaphs it's by chance, but it feel more like a question, and when I spread my fingers in answer, his hand slides into mine. "Then everyone else doesn't know you." It was very easy to like both Percy and Felicity. They were kind, compassionate, warm and smart. Monty I was indifferent too, mostly, but I did warm up to him nearing the end of the book. I liked the undying chemistry between Monty and Percy but I do with that Felicity and Monty had more bonding moments because WHY SHOULD THESE TWO UNCONFORMING CHILDREN NOT BOND? I adored Felicity. She was totally the Hermoine of this book and I just wish she lived in a world kinder to her. HIGHLY RECOMMENDED. A tour across Europe, a biracial and a bisexual boy falling for each other wrapped in history and beautiful places with a sister who can’t live her life the way other women do? Only the best book of 2017 so far! What are some of your favourite historical YA novels? What are some of your favourite LGBT YA Novels? Have you heard about/ are excited for The Gentleman's Guide to Vice and Virtue?